Firstly a bit of history. In 1835 the Birmingham and Liverpool Junction canal (since 1846 known as the Shropshire Union Canal after amalgamating with several other canal companies) was joined to the Shropshire tub-boat system by a branch which left the mainline here by means of passing beneath the Junction bridge, which now leads just 100 yards to our dry dock and offline moorings. We now operate from the Wharf buildings and basin opposite the Junction. Our friendly team can offer you a fully covered and heated wet dock, professional boat painting, slipway, gift shop, groceries, chandlery, fully licensed tea-room, Off license, covered dry dock, boat repairs, hire boats, day boats, full boat yard facilities (ie. pumpout, gas, water) and much much more. We are dealers for most major companies dealing in quality canal related equipment including: Bubble diesel stoves and boilers, Beta Marine engines, Canaline engines, Webasto diesel heaters, Wilsons boat covers, PRM, Calor Gas and Goodwin plastics. To keep up to date with current news at Norbury Wharf Limited please click here. On behalf of Norbury Wharf Ltd, please enjoy browsing our website. Amongst those who spend any time on the canal it's difficult to find individuals who have not come across Simon Jenkins - whether it was during his early days building and restoring boats on the Wyrley and Essington canal, his time carrying cargoes, towing boats or selling painted wares around the canal system or the last ten years, during which time he has transformed the former Anglo Welsh base here at Norbury Junction. Simon is one of those people who exude confidence and optimism. Born in Birmingham, schooled in Sutton Coldfield, Simon was never far away from the canal but he didn't really come onto the water until a spell at Agricultural College where he aquired engineering skills. Restoring a 39ft Springer led onto building a tug, an unusual style in those days and in 1996 he bought an ex-Fellows, Morton and Clayton boat called Empress, a steamer and restored her - including a new bottom plate - working with friends and using his own engineering and welding skills. He was offered work with Anglo Welsh and began living on board boats. As senior engineer at Norbury he got to know the base very well but eventually the entrepreneurial spirit and a desire to cruise the system got the better of him and he set off with his then wife, Lisa, a canal artist, using Empress. Simon said: “We travelled a lot of the system and used the boat for anything from carrying some small cargoes to towing boats. Empress was a proper commercial working boat and we covered 40 rallies in two years all around the country. Soon afterwards Anglo Welsh decided to dispose of Norbury and offered it to Simon, and along with boat fitter Mick Thompson they created the present partnership to take it on. “There is a lot of history here at Norbury and although the place was run down for a couple of years there was a lot we could do. Now we have day boats, hire boats and a trip boat.” In addition the Tearoom is now a popular spot all-year round and the shop sells a range of gifts and essential groceries. They also rent out a holiday cottage next to the wharf. 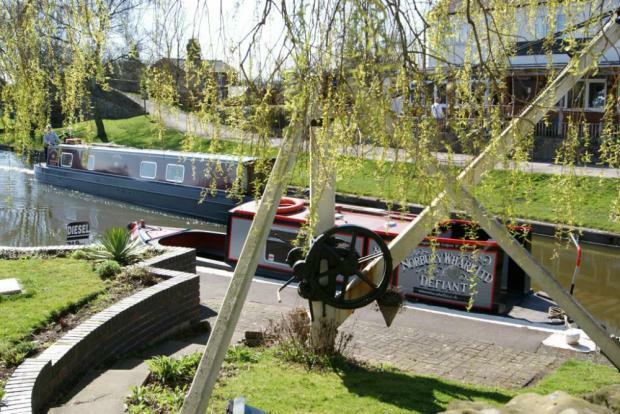 Simon boasts that there is now nothing they cannot do when it comes to narrowboats. Norbury Wharf’s dry dock site in the first of sixteen locks on what was once the Shrewsbury and Newport Canal – and there is nothing Simon would welcome more than its restoration – and he wants it to be re-opened right the way through to Shrewsbury as that would provide a genuine tourist route that would benefit not just the canal network but the economy of the area and the prosperity of his business. Above: David steering Ibex at the 2014 Braunston Boat gathering along with partner Sarah, daughter Elizabeth and good friend Richard Cox. David Ray may only be in his early 30s but his canal pedigree is longer than many, and his knowledge of the canals and historic boats is second to none and he continues to manage a busy boatyard. He was introduced to the waterways by his parents who had a pleasure boat based on the River Stort and says: “By the age of five I was standing on a stall in the door ‘oles steering on my own". Working for a building society didn’t satisfy, although getting a transfer to Stony Stratford enabled him to buy the boat his parent’s had built and he began living on the cut and still actively carrying domestic bagged coal in the Northamptonshire area. That year David bought Hyperion (built by Harland and Wolff for the Grand Union Canal Carrying Company in 1935) in a near derelict state and over the next two years restored her to full working trim (1935 condition) with help from friends and family. He said: “Although I loved Hyperion she wasn’t used to her full potential. I managed to load her on a regular basis with domestic fuel for our local canalside customers and road stone to repair our moorings but I didn’t get to do very much boating with her." 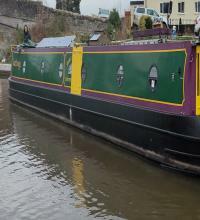 She was home until March 2010, when he purchased Ant (another ex-carrying boat built by EC Jones, Brentford for British Waterways in 1960) a boat Simon had fitted just 6 years previously. He says "Ant offers a lot more living space and is much more comfortable". Three years ago David added a Fellows, Morton and Clayton motor boat "Ibex" to his fleet which can regularly be seen at Norbuy Junction. David can regularly be seen engaged in gatherings, rallies and festivals around the canal system and is still actively involved in canal carrying, although his presence at Norbury takes priority these days. In April 2014 David and his partner Sarah, were pleased to announce the arrival of their first daughter; Elizabeth Flora Ray, who can occassionally been seen playing with the toys in the gift shop.